Time to Fill The Hill crew, game is on at 1pm on Sunday at McGillivray. No coverage on Foxtel as it clashes with QLD Country v Rising which is on at the same time. Anyone got the streaming details for those that can't make it to the game? How hopeless is that, a two hour time difference and those plonkers schedule a clash. What about adjacent games in real time, a double header on Fox. "Never attribute to malice that which can be adequately explained by stupidity, but don't rule out malice." Wikipedia says Sunday's match is 3pm AWST, so maybe someone with editing rights should change that. Actually, hardly any of the Wikipedia times are correct! 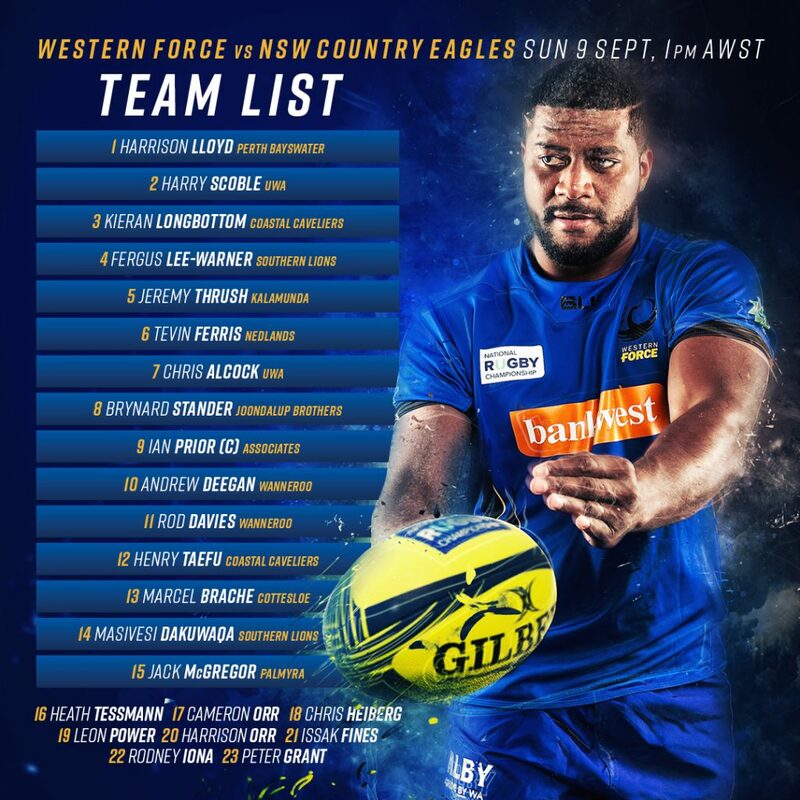 The Western Force are set to play their first home game against the NSW Country Eagles after a thrilling 18 point win in their debut NRC game last weekend. Activities start at 12pm for a 1pm kick-off. With FREE face painting, bouncing castles, giant games, RugbyRoos activities and Touch Sevens clinics there will be entertainment for everyone! There will also be a licensed alcohol area for the grown-ups, serving all your favourite Gage Road products. A live DJ will keep the party going and food vans galore will make sure is well fed. Don't miss out on the festivities of the Western Force in the NRC. The game will be streamed online on FOX Sports. Entries are open to everyone with the winner taking home $500! The 100m race will take place at half-time during the NRC home games. There will be three heats with the winner being decided at the last game. Been hearing ads for the game on 96 FM. For those not happy about The Spirit clocking out; I'd suggest these promos are part of building the Force brand going forward, particularly after other codes are mostly done. So that's good news. I suppose Minderoo are stumping up the cash for that. Dunno about ads on other media apart from Foxtel.. I may be wrong but I think the only thing RA is paying for is the team travel costs. Good god, what happens if we get a WSR-sized crowd for this?! Oh the humanity!!! TV coverage (I Hope as I'm based in QLD) is on FoxSports onDemand option .... if this isn't a true statement I hope RWA has it streamed like the had the World Series Fixtures. Fox has it streaming, so if you have FoxSports, you *should* be able to get the stream. The Western Force are looking to keep the Horan Little Shield in their possession by swapping in a number of players for this Sunday’s clash against the NSW Country Eagles. After suffering an injury in the warm-up leading into a World Series game, Masivesi Dakuwaqa will return to make his first NRC start replacing an injured Clay Uyen (hamstring). Proving to be a crucial force in the scrum during last weekend’s match against Brisbane City, Kieran Longbottom will bring experience and strength to the starting tight five. Chris Heiberg moves to start from the bench. Heath Tessmann will come back to replace one of last weekend’s star players, Feleti Kaitu’u, while he recovers from a restrained hamstring injury. Harrison Lloyd will make a start as loosehead prop as Cameron Orr starts in reserves. In: Masivesi Dakuwaqa and Heath Tessmann. Out: Clay Uyen and Feleti Kaitu’u. Great line up, anyone seen the NSW Country team yet? All times are GMT +8. The time now is 03:21.